I started mulling this over on Sunday while I was posting art pieces from last week. What kept coming to mind was " The Little Engine That Could". I had a lot of Golden Books before kindergarten. If you know about Golden Books, those would be something from the good old days.LOL I think "The Little Engine That Could" was a Golden Book. 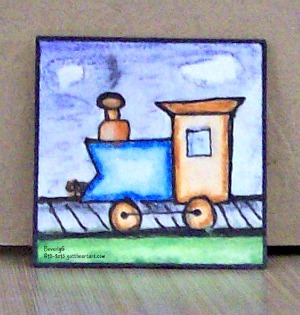 I intended to make the tracks on this Inchie going uphill, but the fact that I actually was able to draw this little engine on an Inchie and it be recognizable as what it is supposed to be is in the vein of the original story. I'm using my own words now, but when you think you can't go anymore or you seem like you are only going uphill, keep puffing (see the steam) and keep on chugging. I got out my Inktense pencils for the coloring and a water brush to blend. I have to tell you before I blew this up the blending looked a whole lot better. Keep chugging and Practicing, Practicing, Practicing. I think you did a great job. Loved my golden books. Love your little engine that could.